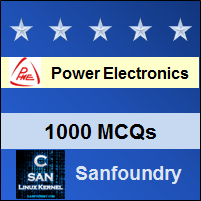 This set of Power Electronics Multiple Choice Questions & Answers (MCQs) focuses on “Firing Circuits – 2”. Explanation: The R firing circuits cannot be used for alpha greater than 90 degrees. 2. For a R firing circuit, the maximum value of source voltage is 100 V. Find the resistance to be inserted to limit the gate current to 2 A. Explanation: R = 100/2 = 50 Ohm. Explanation: The diode is placed between the resistances and gate which ensures that the current flows in one direction only. Explanation: Unlike the R firing circuit, the RC firing circuits can be used to obtain firing angle greater than 180. Although practically 0 and 180 degree is improbable. Explanation: As R2 is the variable, R1 makes sure that the current does not exceed the maximum value when R2 is kept at zero position. 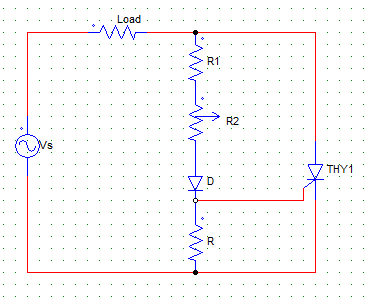 Explanation: For turning on the device, the peak of gate voltage must be equal to the gate triggering voltage. Explanation: For the values of Vgp great than the gate triggering voltage the firing angle is less than 90°. And for Vgp = Vgt the firing angle is equal to 90°. Α cannot go beyond 90° in case of a R firing circuit. Explanation: The given circuit is a RC half-wave firing circuit. 9. 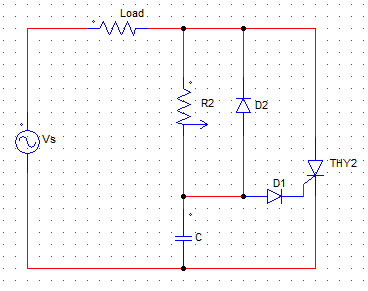 The figure shown below is that of an RC firing circuit. Explanation: The current flows through Vs+ – C – D2 – Load – Vs.
10. Find the value of R in case of an RC firing circuit which is to be turned on with a source voltage of 150 V and the following parameters.